TwinSpires Blog: A Historic Day? On June 7, 2014, at Belmont Park in Elmont, NY, at approximately 6:52 PM Eastern Time, California Chrome will seek to become just the 12th Triple Crown winner in thoroughbred racing history. Since Affirmed became the 11th keeper of the Crown — I know, it sounds like a Tolkien novel — in 1978, 11 horses have captured the first two jewels of the series (the Derby and Preakness) only to fail in the third (the Belmont Stakes). I’ll Have Another would have been the 12th success or failure, but he was scratched the day before the Belmont and never raced again. Will California Chrome make history and “save racing” on Saturday? Time (hopefully under 2:30) will tell. You Call 36 Years a Drought? 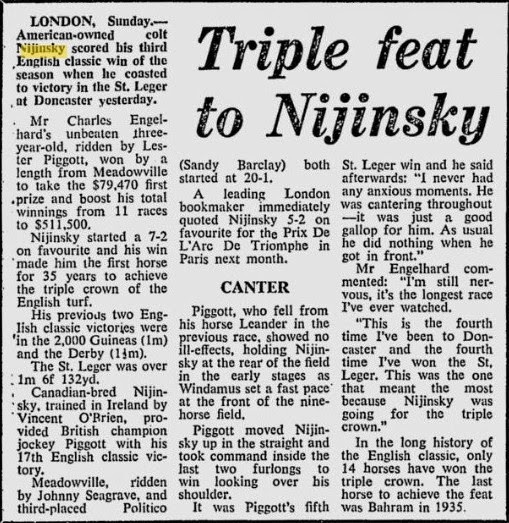 Lost in all the angst over the 36-year gap since Affirmed won the American Triple Crown, is the fact that there hasn’t been an English Triple Crown winner since Nijinsky in 1970 — 44 years ago. In fact, since Nijinsky’s sweep of the one-mile 2,000 Guineas, the 1 ½-mile Epsom Derby and the 1 ¾-mile (approximately) St. Leger Stakes, only three horses — Camelot (2012), Sea the Stars (2009) and Nashwan (1989) — have even had a shot at the coveted English Triple. What’s more, Nijinsky was the first English Triple Crown winner since the Aga Khan’s Bahram in 1935. So, by English standards, capturing the American Triple Crown is like earning a participation ribbon at a grade school field day. 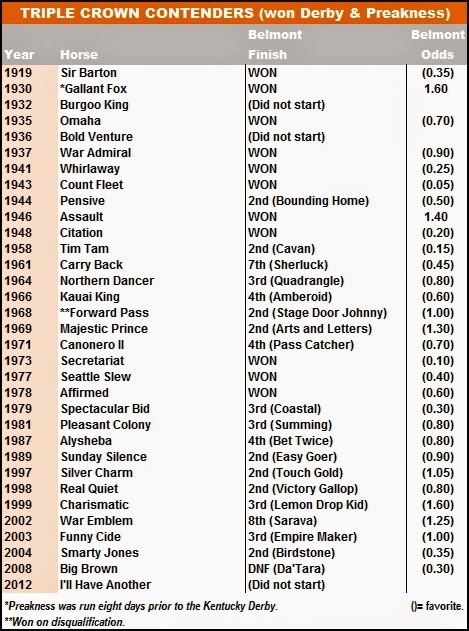 Since 1935, there have been nine American Triple Crown champs. Who said winning the Kentucky Derby, Preakness and Belmont was tough? In “Winning at the Races: Computer Discoveries in Thoroughbred Handicapping,” William L. Quirin, called early speed the “universal track bias” and, despite the 1 ½-mile distance and the vast expanse that is Belmont Park, statistics show that Quirin’s observation holds true for the Belmont Stakes as well. Since 2000, the average Belmont winner has been just 1.91 lengths back at the first (1/2-mile) call and 1.36 lengths in arrears at the second (10-furlong) call. Furthermore, Belmont winners have entered the Test of Champions with an average overall early speed ration (ESR) of -3. 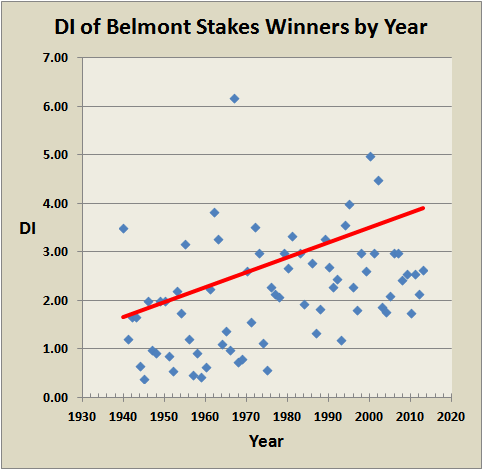 In fact, 9 of the past 14 Belmont champions have met that standard and they have produced an ROI of 258 percent to win, 60 percent to place and 10 percent to show. With all the talk about California Chrome’s lack of distance breeding, I thought I would consult with an expert. Dr. Steven Roman runs the excellent Chef-de-Race Web site and is the creator of the Dosage Index (DI) so often referenced at this time of year. Although no horse with a DI greater than 3.00 has won the Belmont since Empire Maker (3.16) in 2003, Dr. Roman believes that horses like California Chrome, who has a 3.40 Dosage Index, have become the norm rather than the exception. “The patterns over time for all three Triple Crown events are similar, with the Dosage figures of the winners steadily increasing over time since 1940, reflecting the continuous shift toward speed in North American breeding,” Dr. Roman explained. “I doubt if there is a single horse these days bred specifically for the Belmont distance (at least on dirt). The result is that suitability to the distance is more an accident than intentional. Someday, a dozen sprinters may line up in the Belmont starting gate and one of them will have to win — not a pretty picture,” he concluded.